Help! » What must be reviewed by the IRB? What is QI and what distinguishes it from research? When is IRB approval needed (i.e., when is QI human subjects research)? Can QI studies be published even without IRB approval? What ethical oversight is appropriate for QI activities that aren't research? Quality improvement activities are an important component of hospital operations. Because QI activities are data-driven and involve human participants, it is not surprising that there can be overlap with research methodologies common to human subjects research. Where there overlap exists between QI and research methodologies, the federal regulations that protect human research participants may apply. Whether the QI activity is human subjects research or not, it is vital that it be executed in a manner that is ethical and respects the rights and welfare of the human participants. What is Quality Improvement (QI)? A working group from the Hastings Center "...defined QI as systematic, data-guided activities designed to bring about immediate improvements in health delivery in particular settings." Improving the quality of care of patients is a fundamental obligation of health care providers. The QI process involves evaluating and learning from experience. A systematic investigation, including research development, testing, and evaluation, designed to develop or contribute to generalizable knowledge. More information regarding the definition of research and who is a human subject is available elsewhere on this website. An activity that is planned in advance and that uses data collection and analysis to answer a question. Although research must include systematic investigation, many non-research activities also include systematic investigation. Systematic investigation does not, in and of itself, define research. Conducting quality assessment and improvement activities; systems redesign activities; population-based activities relating to improving health, ensuring safety, or reducing health care costs; and case management and care coordination. Reviewing the competence or qualifications of health care professionals; evaluating provider and health plan performance; training health care and non-health care professionals; and accreditation, certification, licensing, or credentialing activities. Underwriting and other activities relating to the creation, renewal, or replacement of a contract of health insurance or health benefits and ceding, securing, or placing a contract for reinsurance of risk relating to health care claims. Conducting or arranging for medical review, legal analyses, or auditing services, including fraud and abuse detection and compliance programs. Business planning and development, such as conducting cost-management and planning analyses related to managing and operating an entity. Business management and general administrative activities. To learn more go to the Resources for How to Improve on the Institute for Healthcare Improvement website. How does QI differ from research? When is IRB approval needed for QI activities? 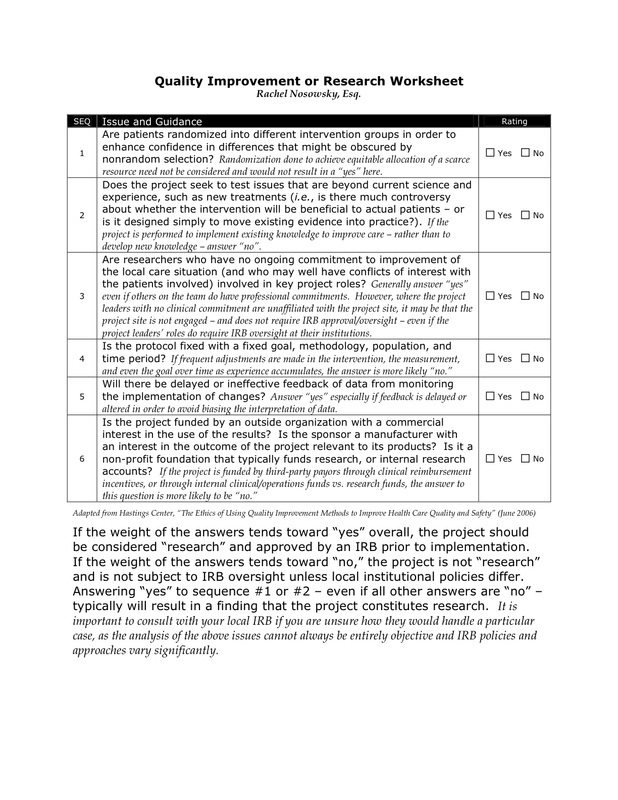 Below are two worksheets for helping investigators ascertain whether or not the IRB should be consulted prior to initiating the QI project. The first worksheet was developed by Rachel Nosowsky, Esq. and is based on The Hastings Center Report The Ethics of Using QI Methods to Improve Health Care Quality and Safety. Download the Worksheet. The second worksheet was developed by the CHOP Quality Improvement Committee (QIC) Ethics Subcommittee and should be used by CHOP QI investigators. The worksheet is available internally to CHOP staff on the @CHOP website at CHOP Screening Checklist for Quality Improvement (QI) Projects. For those unable to download the worksheet from the @CHOP site, it is available here. Download the CHOP QI Screening Checklist. Why doesn't the IRB review all QI activities? The IRB system was designed to provide oversight for human subjects. The system is costly and can take weeks to months to obtain approval. By its very nature, QI is an iterative, adaptive process that often requires rapid action. To force all QI activities into the IRB system would impose such a heavy overhead that many worthwhile projects wouldn't be feasible. Can QI studies be published without prior IRB approval? Publication is only one of many criteria for determining whether a QI activity is also research, by itself, intent to publish is not sufficient to require IRB review and approval. Even though most QI activities aren't research, there is much to be learned from sharing descriptions of these non-research activities. For example, Case Reports are generally not considered to be research but provide a valuable addition to the medical literature. By analogy, lessons learned from a QI activity should be shared with others. Standards for reporting QI initiatives have been developed and published by the SQUIRE Development Group. Individuals intending to publish the results of a QI project should consult this Guideline. The SQUIRE Website has numerous useful tools and guidelines for those doing Quality Improvement work. The IRB provides ethical oversight for human subjects research but there isn't at present, a system for ethical oversight of QI activities. At a minimum, hospital departments and divisions should review all proposed QI activities to ensure that the risks to participants are not greater than minimal and that there are appropriate protections for individual's privacy and confidentiality of their identifiable data. Access to web links is limited to those on the CHOP intranet. 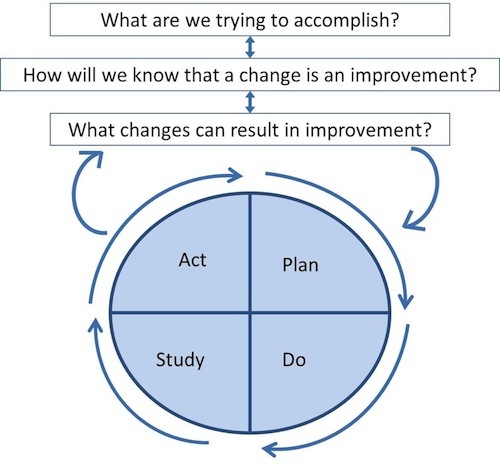 The Common Rule and Continuous Improvement in Health Care a discussion paper sponsored by the Institute of Medicine discusses the interactions and overlap between QI and research. Vogelsang J. Quantitative research versus quality assurance, quality improvement, total quality management, and continuous quality improvement. Casarett et al. Determining when quality improvement initiatives should be considered research: proposed criteria and potential implications. Lynn et al. The ethics of using quality improvement methods in health care. Grady C. Quality improvement and ethical oversight. Davidoff et al. Publication guidelines for improvement studies in health care: evolution of the SQUIRE Project. Baily MA. Harming through protection? Do the regulations governing research involving human subjects apply to all QI activities within CHOP? Not all QI activities meet the definition of research as defined in "the regulations" (45 CFR 46). A radiology clinic uses a database to help monitor and forecast radiation dosimetry. This practice has been demonstrated to reduce over-exposure incidents in patients having multiple procedures. Patient data are collected from medical records and entered into the database. The database is later analyzed to determine if over-exposures have decreased as expected. A group of affiliated hospitals implements a procedure known to reduce pharmacy prescription error rates, and collects prescription information from medical charts to assess adherence to the procedure and determine whether medication error rates have decreased as expected. A clinic implements a widely accepted assessment as part of routine standard of care in order to identify patients requiring special services and staff expertise. The clinic expects to audit medical charts to see if the assessments are performed for the appropriate patients, and will implement additional in-service training of clinic staff regarding the use of the assessment if it finds that the assessments are not being administered routinely to appropriate patients. Can I analyze data provided to me by the owner of a database, that are not individually identifiable, such as medication databases stripped of individual patient identifiers, for research purposes without having to apply the human research subjects protections regulations? Depending on how these data were stripped of individual patient identifiers, the resulting dataset would not meet the definition of human subject as found in the regulations. Thus if the research project includes the analysis of data for which the investigators cannot readily ascertain the identity of the subjects and the investigators did not obtain the data through an interaction or intervention with living individuals for the purposes of the research, this project does not meet the definition of human subjects research and does not require IRB review. Are there types of QI activities that are considered to be research that would require IRB review? If a project involves introducing an untested clinical intervention then this is considered research. When the purpose goes beyond simple QI and also involves collecting information about patient outcomes for the purpose of establishing scientific evidence to determine how well the intervention achieves its intended results, the project will likely meet the definition of human subjects research and will require IRB review. If even a small component of the QI activity is research, then the project must be reviewed by the IRB. I intend to publish the results of my QI activity; does this mean I am required to submit to the IRB for approval? The intent to publish is not a sufficient criterion for determining whether a QI activity involves research requiring IRB review. Planning to publish an account of a QI project does not necessarily mean that the project fits the definition of research. Download the worksheet on this page and if necessary, consult with one or more of the resources listed to determine if IRB review is necessary. Those intending to publish should consult the SQUIRE Website for checklists, explanations, resources and advice about publication standards for QI initiatives.